Boasting a guest list straight out of the pages of European history, the Orea Hotel Palace Zvon Marianske Lazne is easily among the more opulent and fascinating hotels in Marianske Lazne. It is close to many historic sites including the Goethe and Muse sculpture, Caroline's Spring, and the famous Spa Colonnade. It is also very near to the Singing Fountain and the golf course as well. 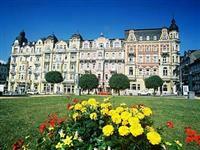 The Orea Hotel Palace Zvon Marianske Lazne is located at Hlavnf 68 which is 19.2 miles from the Karlovy Vary International Airport. Guestrooms in the Orea Hotel Palace Zvon Marianske Lazne are equipped with a personal safe, climate controls, satellite TV, a minibar, high-speed Internet access, direct dial phone service, and a large private bathroom. When staying at the Orea Hotel Palace Zvon Marianske Lazne visitors can look forward to such facilities as the in-house shops, a currency exchange, a business service center, a lounge with bar service, laundry and dry cleaning services, golf course access, a swimming pool, an in-house restaurant, tennis courts, a sauna, airport and railway shuttle services, free daily breakfast service, a spa with massage and beauty treatments, pet friendly policies, and a tour desk.